Automation. We think it’s safe to say many of us love it. The word itself says “Life is easy! Set it and forget it.” With the demands of our daily lives – if automation is available, why would we choose otherwise? Unique Companies offers several Pentair automation products for your pool, some of which also automate your landscape features such as misting systems and low voltage lighting. Pentair is the world leader in pool and spa equipment and accessories. They are also the preferred pool product of Unique! 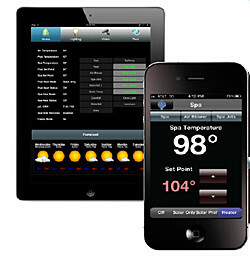 • Easily turn on spa and adjust the desired temperature on the way home from work. • Control all circuits (waterfalls, pool lights, fountains, and more) and review history of temperature, pool/spa, heater, and light operation. Pentair’s Easy Touch system is our most popular automation product allowing full control over pool and spa, with up to 8 functions. Automation systems start at $999 & up. If you are interested in learning more about Pentair’s line of automation products, please visit their website or speak with your Unique sales representative today!